There are multiple topics on this page. Be sure to scroll down to find the one you're looking for! Where should smoke detectors be installed in my house? We should probably mention that although there is a National Fire Alarm Code (from the NFPA, the same people that brought you the National Electrical Code), there may be local codes in your area that supersede the national code, so you should check with your building inspector or fire marshal. Smoke detectors may be ceiling or wall-mounted. Wall mounted ones should be located so that the top of the detector is within 4-12 inches from the ceiling. Ceiling mounted detectors should be located no closer than 4 inches from any wall. 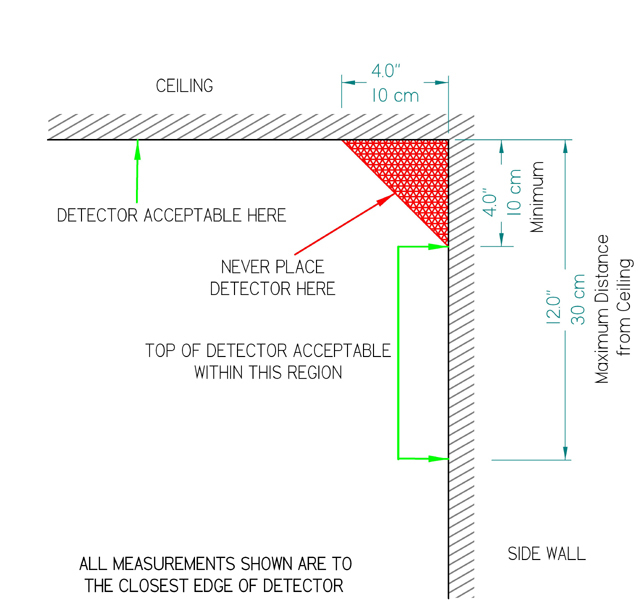 In a room with a pitched ceiling, the detector should be installed at the highest point. Smoke detectors should be installed in every bedroom, in the hall outside of each bedroom door (or groups of doors), and on every level of the house. Additionally, some local codes require that a carbon monoxide (CO) detector be installed in the home as well. This should be located on the lowest habitable floor of the home (carbon monoxide is heavier than air and has a tendency to settle). You can usually get a combination smoke and CO detector and install it on the first floor of the home, thereby meeting two requirements with one device. While these are the minimum installation requirements, there’s no reason why you can’t install additional ones in other areas. Other good locations for smoke detectors would be laundry rooms, attics, and even other non-sleeping rooms of the house. Some locations are not good for smoke detectors. These can include the kitchen (unless you never burn food! ), near an air vent (they tend to gather dust in this location and then stop working), outside of a bathroom door (the steam from the shower can set off a detector), in a room with a wood burning stove, and a garage (exhaust fumes). However, a garage is one place where a fire could start from a parked car. In these instances, you can purchase a heat detector instead. This will still give you protection and minimize false alarms. So what type of smoke detector is best? We usually install a hard-wired (AC-powered) smoke detector with a battery backup. These types of detectors can be interconnected with all the other ones in the house so that if one goes off, it will activate all the other ones, ensuring that occupants in other parts of the house hear the alarm. CO and heat detectors can also be interconnected with the smokes; however, you should not mix brands. If you are building a new house, keep in mind that it is required that your smoke detectors be interconnected. And never forget to change the batteries! Even if your detectors are primarily powered by electric, changing the batteries once every six months ensures they are always ready to work - even during a power failure. We suggest changing them every time you adjust your clocks for daylight savings time (except for you folks in Arizona!). Still need another reason to change your batteries regularly? Then consider this: many times, an electrical fire will cause the main circuit breaker to trip, thereby cutting off AC power to the smoke detectors. That's one reason why battery backups are so important. Smoke detectors. Think of them as an inexpensive life insurance policy and never be without them in your home. My smoke alarms are hardwired with a battery backup. For some reason, half of them have no indicator light on, but when I test them they all go off. What could be wrong? Smoke detectors connected together will set each other off whether they are operating on AC power or the backup battery. If you have no indicator light glowing, then there might be a problem with the AC power at that detector location and it may only be running on battery power. However, it will still work properly (and notify the other detectors when tripped) until the battery runs dead. You should have a licensed electrician check for AC power at the detector locations where the indicator light isn’t on. I am trying to connect my home’s hard wired smoke detectors into my alarm system. Can you tell me how I can do this? The quick answer is, you can’t. Hardwired AC smoke detectors are only designed to be interconnected with other AC smoke detectors, and in this case, only detectors manufactured by the same company. Smoke detectors installed on a security or fire alarm panel are low voltage DC devices (usually 12 or 24 volts DC) and are not able to be connected to the AC smoke detector network in your house. In some cases, it is possible to purchase an interface device from the AC smoke detector manufacturer that would allow you to connect them to your security or fire alarm panel, but it might be a better move to have a licensed security company install more of the low voltage smoke detectors on your system instead. There may be limiting factors in connecting your AC detectors to your alarm panel, even with an appropriate interface device. Lastly, if you decide to add more low voltage smokes, you might be tempted to remove your AC powered smoke detectors. Before doing so, you should check with your local building inspector first. In some municipalities, AC powered smoke detectors are required to be installed in your home, regardless of whether or not you have monitored fire protection as part of a home security system. My smoke detector started chirping about once a minute. I changed my batteries but it didn’t stop. Why could it be doing this? Sometimes the low battery beep takes a couple of hours to stop after changing the battery. If this isn't the case, then make sure you used a battery that was recommended by the manufacturer of the smoke detector, and that it was a brand-new never used battery. If it’s still beeping after this, then you might have a bad detector and you should consider replacing it. Does the power need to be turned off to safely change the backup battery in hard wired smoke detector? Most smoke detectors have a battery compartment that isolates it from the 120 volt connections in the detector to prevent the possibility of getting a shock, so you should be OK.